For over 23 years, Simulab has manufactured realistic human anatomy trainers for high-fidelity realistic healthcare simulated training. Today we take a look at some of Simulab’s key products to demonstrate their dedication to realistic procedure learning with affordable trainers for a dynamic range of learners. 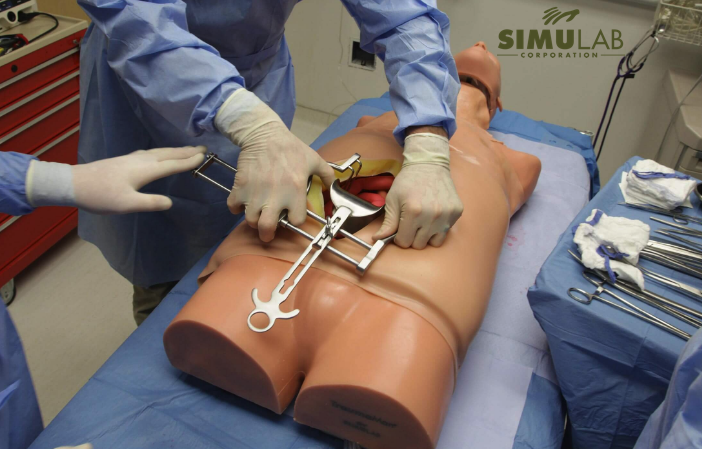 With continued efforts towards improving patient safety and healthcare education, Seattle-based Simulab continues to develop new medical task trainers and patient simulations including a complete line of partial task trainers. We’ve also embedded a few of our exclusive video demonstrations here as well to help you see them in action! TraumaMan is an extendable surgical platform that allows instructors and students to explore a wide variety of procedures under realistic settings as well as to build communication and trauma team experience. Use TraumaMan alone; or add one of numerous extensions to bring your simulation to the next level. Ernest Wang MD of NorthShore University Health System shares that “TraumaMan has been a mainstay of our ICEP Emergent Procedures Course, our EM house staff and student courses, and our recent ACEP Simulation-Based Immersive Medical (SIM) Training Course. Highly recommend!”. The TraumaMan System is the most widely used surgical simulator in the world. Over 375,000 clinicians in 40 countries have completed advanced surgical training using TraumaMan over the product’s rich history. That’s roughly 40,000 medical professionals every year. Since its release, TraumaMan is found and used often in Advanced Trauma Life Support (ATLS) courses, military courses, Emergency Medical Support (EMS) Training and other trauma surgery and emergency life support simulations. TraumaMan allows you to practice a wide variety of advanced surgical procedures including Tracheostomy, Pericardiocentesis, and Diagnostic Peritoneal Lavage to name a few. TraumaMan is the most flexible training platform available for advanced trauma training – it can be combined with high fidelity simulators to run scenarios in team training situations. Available for purchase, rent or lease — and also available for pediatrics with the seperate “TraumaChild” trainer. CentraLineMan is an anatomically correct, clinically relevant Central Venous Catheterization training solution that now comes with time-tested, ultrasound compatible tissue variations so life-like you can feel the palpable differences. This flexible system offers unsurpassed value with clinically relevant anatomy, time-tested ultrasound compatible tissues that maintain visual acuity, market leading durability from needle sticks to full catheterizations all with the ability to interchange the Articulating Head, Body Form Base and Tissues with many of Simulab’s other procedural task trainers. The PacerMan System offers a groundbreaking opportunity to take your transvenous pacing training to a whole new level. With PacerMan, learners can finally practice the whole, emergent procedure in a safe, simulated setting. PacerMan is the first and only high-fidelity simulator for immersive transvenous pacing training—from needle insertion to electrical capture using all the clinical equipment. With PacerMan, clinicians can practice the entire procedure—including identifying intrinsic bradycardias, assessing intracardiac waveforms and manipulating output and rate with a pacing generator. Simulab’s patented SimuSensor technology powers PacerMan, replicating a true clinical workflow by allowing the learner to use their own pacing generator to trigger patient responses on a simulated patient monitor. PacerMan can be set on Instructor Mode, with specifically chosen scenario parameters or randomized Student Mode. Both settings include options for multiple outcomes and offer hands-on learning anytime, anywhere. Refine amperage of electrical output and pulse rate in real time. Increase team engagement with multi-disciplinary scenario based learning. Instructor can choose from a series of scenarios by defining successful capture, thresholds and placement outcomes. SonoMan is an affordable diagnostic ultrasound training platform designed for physicians who need to become proficient in the use of trauma, emergency or bedside ultrasound in evaluating critically ill patients. SonoMan is an affordable diagnostic ultrasound training platform designed for physicians to become proficient in the use of trauma, emergency/bedside ultrasound in evaluating critically ill patients. The system offers the most extensive image and video pathology library with six software modules, each providing up to seven clinical cases presenting with normal or abnormal findings. This allows instructors to mimic a variety of pathologies in emergent or critical care settings. Learn more about these and other helpful training products on the Simulab website today!